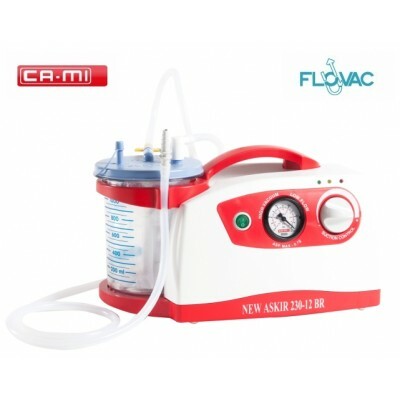 Portable Suction Unit CA-MI ASKIR 230 12V BR FLOVAC® Disposable Liner System comes with FLOVAC® COLLECTION JAR (1L) and 5 disposable liners (5x1L). Thanks to an electronic system for managing the electricity supply with in addition to monitoring the functioning of the internal battery, also enables the equipment to be used at a voltage of 230 V ~ even when the battery is being re-charged. A series of LED on the front control panel signals whether the machine is operating, as well as the charge and re-charge status of the batteries. Portable Suction Unit ASKIR 230 12V BR is equipped with aspiration regulator and vacuum indicator located on the front panel.